The importance of library in an institution, most especially an educational institution, can never be over emphasized. Hence, the library should be very conducive so as to enhance assimilation. 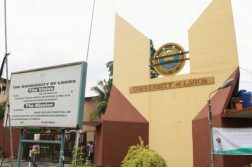 It is newsworthy that the UNILAG main library is gradually taking a new shape. The refurbishing started from the ground floor, where new chairs and reading desks have been provided. It is safe to say that one can now read comfortably without much distraction and disturbance from the students close by. More so, the era of sitting on broken chairs is over. The second floor has also been arranged in such a way as to accommodate more students although there are no new chairs yet. The computer section of the library was not left out. Renovation, rearrangement and provision of new desks took place there. For good library users, this is a welcome development because good environment aids understanding. I use this opportunity to commend the UNILAG management for this great step and also hope that this development be spread to the other floors of the library. Students and other library users are therefore called upon to make judicious use of the library and desist from destruction of library properties. For those who always find one excuse or the other not to read, what is your excuse now? In the light of greater things to come.